If you want a powerful, high-resolution tablet from a reputable manufacturer, you're going to have to pay for it. 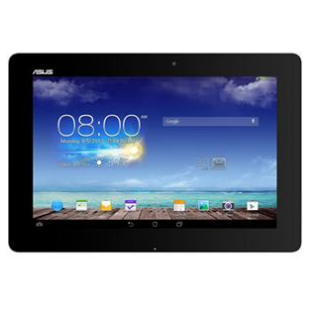 If you'd like to pay considerably less, you should check out the current Adorama listing for ASUS' flagship Transformer Pad. The Infinity TF701T is on sale for $349.99, a full $100 off of the retail price. It's also $50 below Amazon's price. The TF701T is the latest and greatest tablet in the line, combining a speedy Tegra 4 processor, 2GB of RAM, and a 2560x1600 resolution to make a compellingly capable tablet. Adorama doesn't have a sale price on the sold-separately keyboard + battery dock that gives the Transformer line its name, but they do have it for $134.99 ($15 off retail). The sale price of the TF701T actually makes it cheaper than the previous model, at least on Adorama. Other charming specs on the tablet include a full 32GB of storage plus MicroSD card slot, a 5MP rear camera, and ASUS' standard metal housing. Let-downs include a relatively short battery life and a slightly outdated version of Android (Jelly Bean 4.3). If the latter is a problem, you can get a 16GB Nexus 10 (a little long in the tooth, but still a very solid tablet with KitKat) for $343 on Amazon. We don't know how long the Adorama sale will last, so if you want it, get your order in quickly. Free shipping to the US is included.